The Muskingum University Board of Trustees, after a unanimous vote, today announced the appointment of Dr. Susan Schneider Hasseler as Muskingum’s twenty-first president. Dr. Hasseler will take office on July 1, 2016. She succeeds Dr. Anne C. Steele who has served as President since January 1, 2000, leading Muskingum through 16 years of unprecedented institutional development. “Dr. 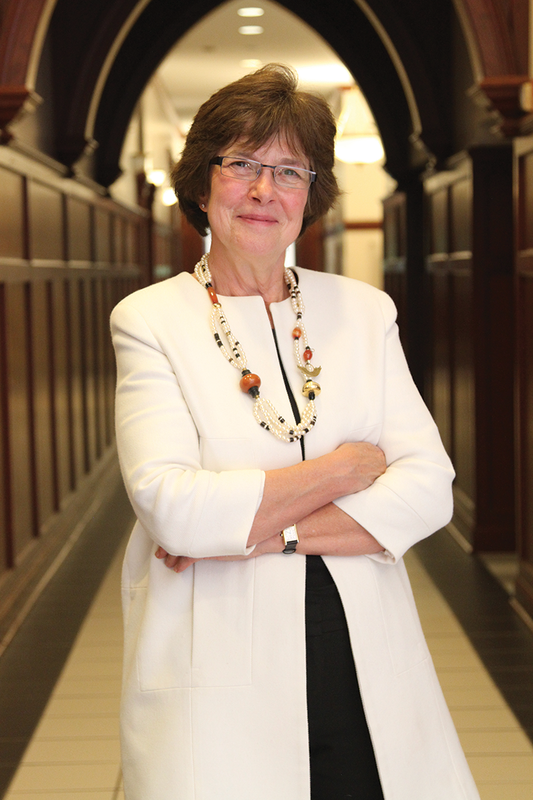 Hasseler’s values, experience and vision uniquely qualify her to advance Muskingum’s mission and continue the University’s tremendous progress into the future,” said Harold W. Burlingame ’62, Executive Vice President Retired, AT&T Human Resources, and Chair of Muskingum’s Board of Trustees. “Dr. Hasseler is a respected academic leader, teacher and scholar, with deep commitments to inclusivity, community engagement, service and building local, regional and national partnerships,” he added. Burlingame thanked the Board of Trustees and the Presidential Search Committee, chaired by Muskingum Trustee Robert W. Patin Jr. ’64, and commended their dedicated efforts throughout the 10-month search process. Dr. Susan Hasseler is currently senior vice president for Academic Affairs at Augustana University in Sioux Falls, South Dakota, where she oversees a wide array of undergraduate, graduate and continuing education programs, academic support operations and cross-disciplinary centers and institutes. She has worked with the president and her colleagues to help Augustana broaden student audiences and build a sustainable future through developing and implementing a new strategic plan; creating an integrated student success and career center; establishing a new Office of Graduate and Continuing Education and launching multiple new graduate programs; leading a revitalization of the liberal arts core and first year experience; introducing collaborative enrollment, retention and branding initiatives; and participating in the development and launch of a new comprehensive campaign. She was previously dean of the School of Business, Education and Social Sciences and Dean of Community Engagement at Messiah College in Mechanicsburg, Pennsylvania and Associate dean for Undergraduate and Graduate Teacher Education at Calvin College in Grand Rapids, Michigan. As a faculty member, Dr. Hasseler served as professor and associate professor of education at Calvin College and as assistant professor of education at Michigan State University. She has published extensively and presented widely on the topics of educational leadership, inclusivity, international education and cross-cultural experiences. An active leader in national higher education associations, she is currently a member of the Board of Directors of the American Council of Academic Deans and presents regularly for the Council of Independent Colleges. She serves in multiple community organizations including the Sioux Empire United Way, the Sioux Falls Chamber of Commerce and the Rotary Club of Downtown Sioux Falls. Dr. Hasseler holds a B.S. in elementary and special education from Calvin College, an M.A. in special education from the University of South Dakota, and a Ph.D. from Northwestern University’s School of Education and Social Policy. She is married to neuropsychologist Kenneth Hasseler, who also earned his Ph.D. from Northwestern University. They enjoy the visual and performing arts, athletics, campus and alumni events, hiking, biking, exploring the art, architecture and geography of new places, and spending time with their daughter, Kaitlin, and their son, Jon and his wife Mallory. What does it mean to be a globally oriented college? Are some international experiences better than others? Are colleges doing enough to integrate international students on their own campuses? And what steps can we take to improve global education for college students? Factory jobs dwindled over the past several decades, and instead of low-skill, low-wage service work filling the void left by manufacturing's decline, a new report shows that college-educated workers have taken over a much bigger share of the economy. While the makeup of the labor force has changed, the shift has not been from a manufacturing-driven economy to one underpinned by legions of people in dead-end fast-food jobs. Rather, the country's economic value is now largely propped up by college graduates.